Yield curve flattens13 as Fed rate hike expectations move higher. The spread between the 10-year U.S. Treasury and 2-year U.S. Treasury yield reached a decade low last Wednesday at 0.41%14 before ending the week slightly higher at 0.50%.15 Rising 10-year inflation breakeven rates16 contributed to a moderate sell-off in 10-year U.S. Treasuries,17 while 2-year U.S. Treasury yields also moved up reflecting Fed rate hike expectations.18 A June rate hike is now considered a 90% probability as measured by Fed fund futures.19 Additional Fed activity in 2018 may be constrained by the possibility of an inverted yield curve20 which could negatively impact growth. President Donald Trump announced his intent to nominate Richard Clarida as Fed Vice Chair and Michelle Bowman to the Fed board. These picks, along with the earlier nomination of Marvin Goodfriend (not yet confirmed), leave just one open Fed board seat. Global inflation remains near prior levels aside from the UK. Headline UK Consumer Price Index (CPI) decreased to 2.5% year-over-year (y/y), while UK core CPI decreased to 2.3% y/y. The Bank of England (BOE) sought to quell inflation when it hiked interest rates late in 2017. With inflation moving closer to the central bank’s 2% target, the BOE may not have to increase interest rates again as quickly as originally thought. Europe saw a slight downtick in headline CPI to 1.3% y/y and core CPI is unchanged at 1.0% y/y. Inflation readings in Japan were also largely unchanged, with a CPI figure of 1.5% y/y and a core CPI figure of 0.5% y/y. Technology companies take the stage in big week for earnings. A number of widely followed tech companies will release earnings this week including Facebook (FB), Alphabet (GOOGL), Intel (INTC), and Microsoft (MSFT). 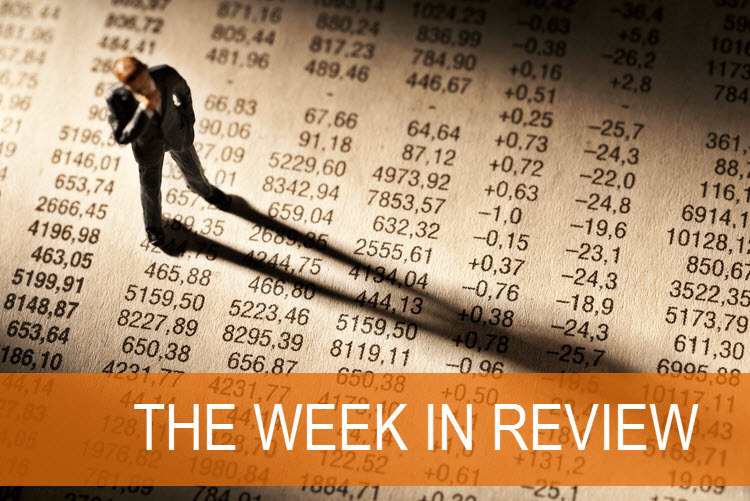 Investors will be looking for company commentary on impacts from data privacy concerns and the possibility of increased regulation, both of which have weighed on performance for the sector in the last few weeks. Other notable releases include Amazon (AMZN), Coca Cola (KO), Exxon Mobil (XOM), United Parcel Service (UPS), Starbucks (SBUX), Boeing (BA), Caterpillar (CAT), Verizon (VZ), 3M (MMM), Lockheed Martin (LMT) and AT&T (T). Flash PMIs expected to remain near prior levels. Flash manufacturing Purchasing Managers’ Index (PMI) readings will be released this Monday. Surveys expect each of the major regions to post figures in-line with last month, which would leave all of the major regions well within expansionary territory (above 50).23 This would help calm some investors’ concerns on softening global growth data. Little expectation for policy changes at ECB and BOJ meetings. The European Central Bank (ECB) and the Bank of Japan (BOJ) both meet this week, with markets largely expecting both central banks to leave interest rate policy unchanged. The ECB is expected to continue its €30 billion monthly asset purchase program until September 2018, though markets will look for clues on future ECB policy normalization plans. Bloomberg, MSCI U.S. Equities IMI Index returns 16Apr2018 – 20Apr2018. Bloomberg, MSCI ex-U.S. Equities IMI Index returns 16Apr2018 – 20Apr2018. Bloomberg, MSCI Emerging Market Equities Index returns 16Apr2018 – 20Apr2018. Bloomberg, MSCI ex-U.S. Equities IMI Index returns 02Jan2018 – 20Apr2018. Bloomberg, MSCI Emerging Market Equities Index returns 02Jan2018 – 20Apr2018. Bloomberg, Bloomberg Commodity Index returns 16Apr2018 – 20Apr2018. Bloomberg, Dow Jones Commodity Index Aluminum is designed to track the aluminum market through futures contracts. All Dow Jones Commodity Indexes are broad measures of a commodities futures market that emphasizes diversification and liquidity utilizing an equal-weighted approach. Bloomberg, Dow Jones Commodity Index Nickel is designed to track the nickel market through futures contracts. All Dow Jones Commodity Indexes are broad measures of a commodities futures market that emphasizes diversification and liquidity utilizing an equal-weighted approach. Bloomberg, Dow Jones Commodity Index Palladium is designed to track the Brent Crude market through futures contracts. All Dow Jones Commodity Indexes are broad measures of a commodities futures market that emphasizes diversification and liquidity utilizing an equal-weighted approach. Bloomberg, Dow Jones Commodity Index Crude Oil is designed to track the Brent Crude market through futures contracts. All Dow Jones Commodity Indexes are broad measures of a commodities futures market that emphasizes diversification and liquidity utilizing an equal-weighted approach. Bloomberg, S&P Natural Resources Index returns 02Jan2018 – 20Apr2018. Bloomberg, Bloomberg Commodity Index returns 02Jan2018 – 20Apr2018. Bloomberg, Yield curve as of 20Apr2013 and is constructed by plotting a sessions final yields for various maturities. Bloomberg, In this analysis we are making a comparison between the difference of the 2-Year nominal Treasury rates versus the 10-Year nominal Treasury rates using data available as of 18April2018. Bloomberg, In this analysis we are making a comparison between the difference of the 2-Year nominal Treasury rates versus the 10-Year nominal Treasury rates using data available as of 16April2018 - 20Apr2018. Federal Reserve Bank of St. Louis, The breakeven inflation rate represents a measure of expected inflation derived from 10-Year Treasury Constant Maturity Securities and 10-Year Treasury Inflation-Indexed Constant Maturity Securities and implies what market participants expect inflation to be, on average, in the next 10 years as of 16Apr2018 – 20Apr2018. Bloomberg, 10-Year Treasury Rate 16Apr2018 - 20Apr2018. Bloomberg, 2-Year Treasury Rate 16Apr2018 - 20Apr2018. Bloomberg, Fed Funds Futures Index 20Apr2018. Fed funds futures are used by banks and fixed-income portfolio managers to hedge against fluctuations in the short-term interest rate market. They are also a common tool traders use to take speculative positions on future Federal Reserve monetary policy. Bloomberg, Phillip Morris (PM) stock price as of 19Apr2018. Peters, B. Investor's Business Daily. "Stocks Dive, But S&P 500 Earnings Beating Estimates By Most In Years." Retrieved on 23April2018 at: https://www.investors.com/news/company-earnings-beating-estimates-by-most-in-years-despite-dow-sp-500-dive/. “A PMI of more than 50 represents expansion of the manufacturing sector when compared to the previous month. A PMI reading under 50 represents a contraction, and a reading at 50 indicates no change. The Institute of Supply Management (ISM) generates the PMI each month.” Retrieved on 23Apr2018 from https://www.investopedia.com/terms/p/pmi.asp.